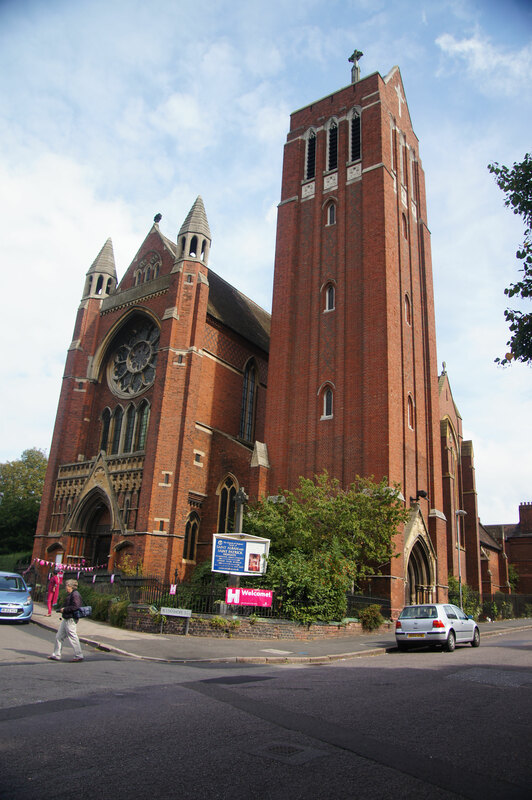 St Alban's west end - image by Tim Ellis on Flickr reusable under a Creative Commons licence. The ancestor of St Alban's church was built on the corner of Leopold Street and Dymoke Street as a mission of Holy Trinity, Bordesley in 1865. The original building, which could accommodate 250 people, was extended in 1867 and was used as a school during the week. In 1871 a second church was built alongside it and a parish was assigned out of Holy Trinity, Bordesley. The name of St Alban's originates from this time. The older building was partitioned providing separate school rooms for boys and girls. The new church building by John Davis could accommodate 480 worshippers and was so designed that it could be sold as a warehouse in case the mission here should prove unsuccessful. A large new church of red brick with stone dressings, designed by John Loughborough Pearson in Early English style, was started at the corner of Conybere Street and Stanhope Street in 1880 but not completed until 19 years later and then with an unfinished tower. This is a large tall building with stone-vaulted roofs, apsidal chancel, clerestoried nave, aisles, transepts and north and south chapels. Although far from finished, it opened in 1881; it was consecrated in 1899. The tower was completed in 1938 by architect E F Reynolds. Additional accommodation was added to the north-east of the church in the second half of the 20th century. St Alban's church looking east - image by Tim Ellis on Flickr reusable under a Creative Commons licence. Historic England website - https://historicengland.org.uk/listing/the-list/list-entry/1290539. See also Tim Ellis's collection on Flickr - https://www.flickr.com/photos/tim_ellis/albums/72157647200562138.